We are happy to inform our readers of next year’s Summer Symposium of the Roman Forum in Gardone Riviera. We encourage our readers to attend this important gathering of Catholic thinkers. Or to support their important work through prayer and donations. The twenty-sixth annual Summer Symposium at Gardone Riviera derives its theme from the centennial concluding the “War to End All Wars”, fought “To Make the World Safe for Democracy” with the aid of a League of Nations that was to guarantee peace the globe over. Unfortunately, 1918 provided an entry into a twenty-one year period of disruptions rather than into an epoch where the lion would lie down with the lamb. Gardone’s international faculty will demonstrate that our current age---the terminal stage of modernity---is actually a child of the interwar period. Yes, it is true that contemporary modernists, like those of each previous stage in modernity’s development, lay false claims to presenting something excitingly new, their Catholic brethren characteristically viewing the pontificate of Pope Francis as the latest fresh breath of the celestial zephyr. Nevertheless, all of late modernity’s last gasp efforts to destroy man, nature, and culture---in order, ultimately, to make the world safe for shopping--- were given their definitively elitist, willful, power-mad, and seemingly irresistible shape in the interwar years in question. This includes Catholic contributions to terminal modernism through new theology, personalism, ecumenism, liturgical renewal, and the embrace of varied political ideologies. But a second and more joyful goal of the Summer Symposium will be that of celebrating the many powerful and endurable achievements of this same interwar era; achievements of unchanging value to us still today. These were accomplishments in every realm of human endeavor, from theology to literature and music; accomplishments many of which were the product of flawed but good-willed natural men striving with great talent to deal with problems of life they did not completely understand. Many Catholics participated brilliantly in such endeavors, by probing still more deeply the fullness of Sacred Tradition, and by seeking to guide those wandering in the interwar desert to the supernatural revelation and grace that could correct and perfect their already highly praiseworthy labors. All these achievements, deemed doomed to certain defeat by modernists convinced that they alone were fitted for survival, are testimonies to the innate vigor of everything Catholic and truly rational, as crucial for us to study today as for believers of the 1920’s and 1930’s. The Summer Symposium’s music program involves daily Mass and Vespers, and Gardone, 2018 promises to be especially rich in its offerings. It is important to note that the Roman Forum is just as happy to receive applications from those whose interest is primarily in Church Music as it is from those focused in other areas of Catholic concern. Our music director, Mr. David Hughes, is eager to attract participants with vocal abilities who would be willing to commit themselves to daily rehearsals to ensure a better rendition of Gregorian Chant and the polyphonic pieces to be sung. Please let us know if you desire further information on our musical “boot camp” for Gardone, 2018. 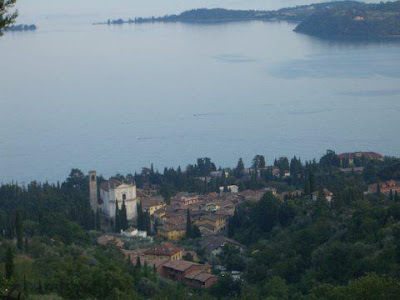 Accommodation and lectures are at the Locanda agli Angeli and the Hotel Villa Sofia in Gardone Sopra, on Lake Garda, in the foothills of the Alps in northern Italy. Both hotels, with swimming pools of their own, are only a ten-minute walk from the lakefront, where free, clean beaches with a number of amenities can be found. Meals are taken at the Angeli and at other trattorie several minutes walk away. Mass is in the parish church, also within walking distance. Gardone is within easy traveling distance of the opera season in Verona, Venice, Trent, Brescia, Milan, Ravenna, Pavia and Padua. The region offers opportunities not only for swimming, but for hiking, biking, boating, and scenic walks as well. Each day involves two lectures with discussion (morning and pre-dinner), and Sung Mass in the Extraordinary Rite (Tridentine Mass) at noon. Other masses, both Tridentine and the Divine Liturgy of St. John Chrysostom, are offered throughout the day. There are no lectures on Sundays. Musical and theatrical entertainments take place in the garden of the Angeli and in the Piazza dei Caduti in the evenings after dinner.